There is a commonly held view today among both Christians and the secular that the well known Roman Catholic nun Mother Teresa was good and loving, and that she devoted her life's energies to alleviating the suffering of others. This view has been summed up in the oft repeated response that Christians sometimes encounter from unbelievers when they are being pressed about goodness, morality, and one's standing before God. The response, from the lost person whose conscience has been pricked, goes something like this: "Hey, I'm no Mother Teresa but I'm no Hitler either." In that statement, one can see that Hitler has been cast in the role of a person universally regarded and known to embody evil, while Mother Teresa is the antithesis to that: the universal embodiment of goodness. But is this the reality about Mother Teresa? Was she the essence of goodness and selfless giving of herself to those who were suffering? First, let's discuss the biblical view of suffering as compared to the Catholic view of suffering. The biblical understanding of suffering is that God allows and uses suffering of every kind (physical, emotional, mental, and spiritual) to sanctify believers and conform them more and more to the image of Christ, and that in the midst of these trials, Christians can entrust themselves to God's wisdom, goodness, comfort, and eternal purposes. So that is the Christian view of suffering: God providentially allows suffering, and uses it to sanctify us, to conform us to the image of Christ, to teach us perseverance, to grow us in compassion, and to cause us to love Him more, and learn to entrust ourselves to Him more and more. These are wonderful promises and blessings that the believer can hold fast to in trials. "At the time of her death, Mother Teresa had opened 517 missions welcoming the poor and sick in more than 100 countries. The missions have been described as 'homes for the dying' by doctors visiting several of these establishments in Calcutta. Two-thirds of the people coming to these missions hoped to a find a doctor to treat them, while the other third lay dying without receiving appropriate care. The doctors observed a significant lack of hygiene, even unfit conditions, as well as a shortage of actual care, inadequate food, and no painkillers. The problem is not a lack of money--the Foundation created by Mother Teresa has raised hundreds of millions of dollars--but rather a particular conception of suffering and death: 'There is something beautiful in seeing the poor accept their lot, to suffer it like Christ's Passion. The world gains much from their suffering,' was her reply to criticism, cites the journalist Christopher Hitchens. 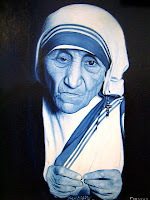 Nevertheless, when Mother Teresa required palliative care, she received it in a modern American hospital." Many Catholic monks (and some devout layperson Catholics) follow in Mother Teresa's view of intentional-physical-suffering-brings-holiness, and self flagellate (i.e., cause physical harm to themselves on purpose), fast for days on end, sleep in the freezing cold exposed to the elements, wear painful metal implements attached to their own bodies that inflict physical pain, etc. They do this under the delusion that purposefully bringing about physical pain will bring them more holiness, and bring them closer to God, in much the same way that they believe the elements of the Catholic Mass give them little injections of holiness every time they partake. Is this not the essence of demonic deception? I can imagine Satan laughing in glee at this wicked deception he's gotten people to buy into that causes them to create physical torment in themselves or refuse to alleviate it in others. After all, we must remember that Satan hates all humans because we are made in the image of God, and is like a roaring lion, prowling the earth seeking whom he can devour (1 Peter 5:8). This is probably hard for most Christians to comprehend, but please, if you have Catholic friends or neighbors in your life that you care about, take some time to familiarize yourself with some of their beliefs, and what Paul called "doctrines of demons" (1 Tim 4:1). Catholics need the life giving truth of the gospel, the true gospel, and to understand that there is nothing they can add to Christ's finished work on the Cross. In this very important work, Dr RC Sproul (Presby-PCA) and John MacArthur (Reformed Baptist) got together and presented a biblical response to the ECT document calling into question its premise, which is that Christians and Catholics can go forth together in a united front to evangelize the lost. Obviously, the presupposition there in the ECT is that Christians and Catholics are both true believers, and both have a life-giving message to take to the lost. MacArthur and Sproul explain why the 2 camps cannot join forces together. They explain that while Christians and Catholics share some common ground and terminology, they have fundamental, core and foundational differences in several significant areas, chiefly in their soteriological views (i.e., how it is that man is saved). And that's the hinge that swings the whole door of salvation. The response to the ECT document was broken out into 6 parts entitled "Irreconcilable Differences." There are transcripts of the response, as well as 2 audio teaching sessions.